Welcome to the Sancreed "ON LINE PARISH CLERK". web page. This site is for everyone to enjoy as well as being a tool to help Genealogist, Historians, and others carrying out research. 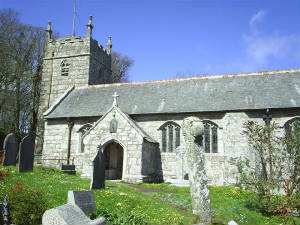 The aim is to provide information from an historical viewpoint on Sancreed which is in Cornwall and one of the most westerly parishes in the United Kingdom. As the OPC I will endeavor to provide a number of resources here to help you with your research whilst at the same time hoping that you will share your knowledge with others through the site. I would welcome constructive comment and suggestions on how I can improve its content. I would like to thank Diane Donohue and George Pritchard for help in transcribing the Parish records, I am planning to add more in the future. George also transcribed other records and built this site. Thanks to Phil Hollywood, Carol Moffat, Kay Hinnrichsen, Mike McCormick, Althea Johnson, Paul Brewer and Ric Parsons,who as members of the Cornwall Census transcription team were responsible for producing the 1841, 1851 and 1891 census for Sancreed. If you feel that I may be able to help with further information or if you have any records for the parish which you would be willing to place on the site please contact me. Cut and paste the address into your browser replacing <at> with @ . This has been done in order to stop some of the spam we recieve.